The National Civil Rights Museum in Memphis has reopened following a $27.5 million renovation that featured AV design, installation and programming by Electrosonic. 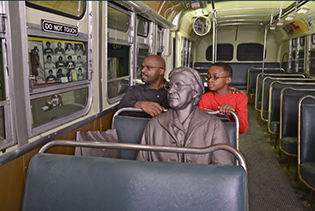 Nearly 50 years after the passage of the landmark Civil Rights Act, the renovated museum is a celebration of old and new; the museum has retained the iconic Montgomery Bus, sit-in lunch counter, and Memphis sanitation truck, which are complemented by new spaces, films, and interactive audio and video exhibits installed by Electrosonic. In one of the museum’s original exhibits, visitors can hear audio that’s triggered by entering the bus. Located at the site of the former Lorraine Motel, where Martin Luther King, Jr. was assassinated, the National Civil Rights Museum enlisted Electrosonic to work closely with exhibition designers, Howard+Revis Design Services, on numerous new displays and exhibition spaces. The motel’s courtyard was renovated to house five interactive "listening posts," including 10-inch outdoor-rated touch screens, waterproof speakers, and network-enabled video players with touch screen interfaces. The “Mapping Slavery and Resistance” exhibit features an ultra short-throw NEC projector and an 85 by 53-inch rear projection screen. In the newly-enlarged Introductory Theater a 12-minute movie introduces visitors to the museum and recaps the history of the civil rights movement. Electrosonic outfitted the theater with a 6,000-lumen, ceiling-mounted Christie 3 chip DLP projector, which makes an image on a 20 by 11.25-foot screen. Electrosonic also provided the theater’s surround sound system and the AV system controller, which times and commands the show. In addition to operating in film mode, the theater is equipped for presentations with a small portable rack featuring a Blu-ray player and AV switcher. A custom plate enables connection to an Ethernet network and the VGA output of a laptop; remote control is provided on an Apple iPad. The main exhibit area is packed with compelling displays conveying the struggles of the civil rights movement. “Living Under Jim Crow” features 30 portraits, which deliver testimonials when touched. “Brown Versus Board of Education” has a 67 by 50 inch front projection screen, a 3,000-lumen ultra short-throw NEC projector, and wall and ceiling-mounted speakers. Three 55-inch monitors, in portrait mode, fitted with a multi-touch overlay frame help visitors engage in “Mapping School Desegregation” across the country. Four interactive stations, featuring mini PCs, Elo 15-inch touch screens, headphone amps and handsets, bring the “March on Washington” to life. The momentous “Freedom Summer of 1964” is illustrated by a 3,000-lumen ultra short-throw NEC projector mounted below and behind a rear projection screen made of a rigid material with an image size of approximately 62 by 44 inches. Martin Luther King, Jr. makes his famed “Mountain Top Speech” on a 55-inch monitor and four ceiling speakers. Gospel singer Mahalia Jackson is heard over four ceiling speakers, which gradually increase in volume as visitors enter the space between the rooms where King and his guests stayed that fateful night in Memphis. The museum tour ends almost as it began, in the new Ellipsis Theater where a 6,000-lumen 16:9 ceiling-mounted Panasonic projector displays images on a 183 by 103-inch wall-mounted screen. One long speaker is installed under the screen along with eight ceiling speakers and two ceiling-mounted subwoofers. An FM wireless assisted listening system is available for visitors.